Locally native on our nursery site Fringe Cups or Fairy Bells as they are commonly known are a spreading perennial for moist shady sites. Low mounding maple shaped leaves cover the ground densely and in late spring vertical spikes appear to 18″ tall and sport rows of small green cup shaped flowers. 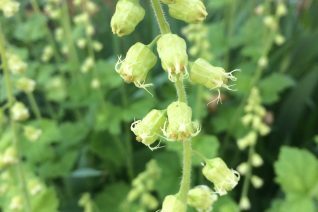 Closely related to Heuchera and thrives in the same conditions. It will even take full sun in moist conditions. It is a background plant because it often suffers from powdery mildew late in summer. The drier the conditions the worse the affliction. Good air circulation helps but its best to just accept that this is how this native perennial rolls. Semi-evergreen in winter. Woodland borders, shady containers. Very easy to grow. Oregon Native Plant.